Kasey Kahne, with an assist from Kyle Busch and Paul Menard, won Saturday night’s Sprint Cup Series race at Atlanta Motor Speedway and locked himself into the upcoming Chase playoff. The victory was Kahne’s first of the season and came with just two races to go before the start of the Chase. 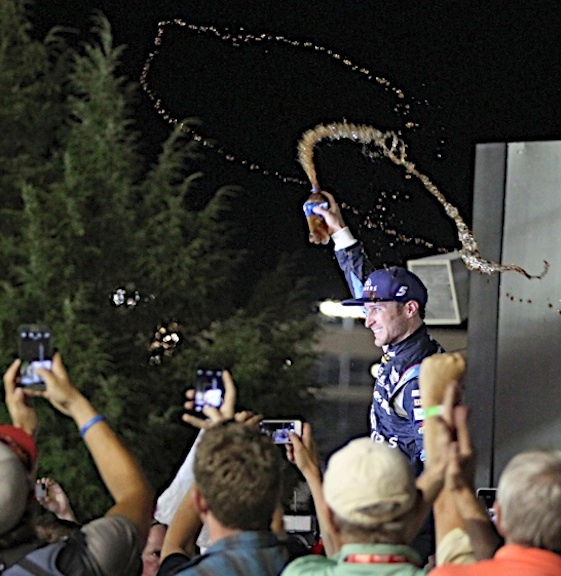 The win was secured by a couple of late-race tussles in involving other drivers. The first occurred when Kyle Busch slammed Martin Truex Jr. from behind with two laps to go and Kevin Harvick running a distant second to Kahne. The wreck cost Kahne his shot at an easy win and Truex wondering what was going on in Busch’s head. “I couldn’t drive off the corners,” Truex said. “But we hung in there, fighting for every possible position until Kyle (Busch), for whatever reason, ran into the back of me, causing pretty good damage to our car. I passed him clean earlier and then he comes back and hits me from behind. It was totally uncalled for and hard to figure out why he did what he did. Matt Kenseth stayed out during the ensuing caution and restarted P1 on the green/white/checkered restart. Shortly after the restart, Menard forced Kevin Harvick, who had dominated the race by leading 195 laps, into the wall and brought out forced a second green/white/checkered restart. On that restart, Kahne, who restarted on P2 on the outside, stayed with Kenseth through the first several turns. Kenseth wiggled on the final lap when running along side of Kahne and that sealed the finish. Kenseth finished second and secured a Chase berth based on points. Denny Hamlin finished third, Jimmie Johnson fourth and Carl Edwards fifth. The final pre-Chase race is scheduled for next weekend at Richmond International Raceway. Thanks to a great night in Atlanta, it’s a race which Kahne will start sans pressure. 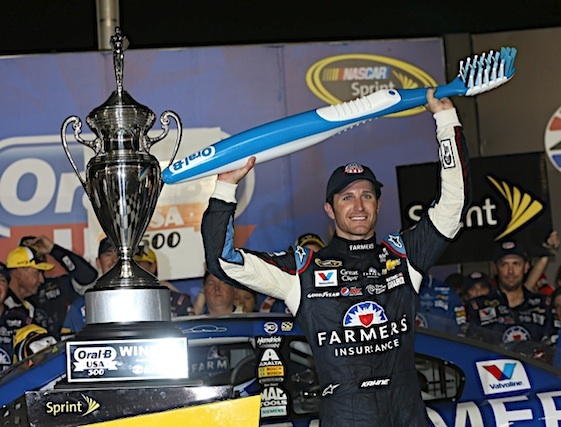 “Yeah,” Kahne said, “it was just an unbelievable way to make The Chase. And to win at Atlanta, it’s a tough track, a track that I love coming to. And so, it feels really good to get a victory here tonight. “We had an up-and-down night. We started — I could barely get through the corner, I was loose. I fell back to about 22nd, I think. “Then made some adjustments and got rolling. We got up to about 5th just by passing cars. So, I felt really good about the car. And then, we kind of dialed ourselves out again. Fell back. Went a lap down. “Then came back again at the end. The last 60 laps, I felt really good. I was able to get that restart, get by Denny, and just could kind of pace. Myself and Harvick were pretty equal at that point in time, when I was in the front and had the clean air. So that helped us. 1. (10) Kasey Kahne, Chevrolet, 335, $310965. 2. (5) Matt Kenseth, Toyota, 335, $264741. 3. (17) Denny Hamlin, Toyota, 335, $182705. 4. (16) Jimmie Johnson, Chevrolet, 335, $198516. 5. (11) Carl Edwards, Ford, 335, $147505. 6. (27) Danica Patrick, Chevrolet, 335, $133095. 7. (4) Ryan Newman, Chevrolet, 335, $127545. 8. (3) Kyle Larson #, Chevrolet, 335, $150840. 9. (7) Aric Almirola, Ford, 335, $151506. 10. (18) Greg Biffle, Ford, 335, $154470. 11. (20) Dale Earnhardt Jr., Chevrolet, 335, $119860. 12. (15) Jamie McMurray, Chevrolet, 335, $144049. 13. (22) Kurt Busch, Chevrolet, 335, $110135. 14. (14) Joey Logano, Ford, 335, $145126. 15. (19) Brian Vickers, Toyota, 335, $141710. 16. (8) Kyle Busch, Toyota, 335, $151751. 17. (9) Jeff Gordon, Chevrolet, 335, $149546. 18. (33) Paul Menard, Chevrolet, 335, $132824. 19. (1) Kevin Harvick, Chevrolet, 335, $158218. 20. (26) Ricky Stenhouse Jr., Ford, 334, $141010. 21. (25) Michael Annett #, Chevrolet, 334, $121343. 22. (24) Casey Mears, Chevrolet, 334, $126418. 23. (6) Martin Truex Jr., Chevrolet, 334, $129393. 24. (13) Austin Dillon #, Chevrolet, 334, $146096. 25. (29) Ty Dillon(i), Chevrolet, 332, $111418. 26. (31) Justin Allgaier #, Chevrolet, 332, $119018. 27. (38) David Ragan, Ford, 331, $116207. 28. (37) David Gilliland, Ford, 330, $105935. 29. (43) Reed Sorenson, Chevrolet, 330, $97660. 30. (40) Cole Whitt #, Toyota, 329, $99010. 31. (42) Landon Cassill(i), Chevrolet, 329, $96860. 32. (41) JJ Yeley(i), Ford, 328, $94185. 33. (36) Josh Wise, Chevrolet, 328, $94010. 34. (35) Brett Moffitt, Toyota, 327, $101860. 35. (30) Alex Bowman #, Toyota, 326, $93685. 36. (39) Ryan Truex #, Toyota, 326, $93560. 37. (34) Joe Nemechek(i), Ford, 324, $93391. 38. (21) Clint Bowyer, Toyota, 314, $122756. 39. (2) Brad Keselowski, Ford, Accident, 296, $130173. 40. (23) AJ Allmendinger, Chevrolet, Vibration, 258, $79765. 41. (12) Tony Stewart, Chevrolet, Accident, 170, $109923. 42. (32) Marcos Ambrose, Ford, Engine, 122, $98110. 43. (28) Mike Bliss(i), Chevrolet, Vibration, 23, $68265. Average Speed of Race Winner: 131.514 mph. Time of Race: 03 Hrs, 55 Mins, 22 Secs. Margin of Victory: 0.574 Seconds. Caution Flags: 10 for 56 laps. Lap Leaders: K. Harvick 1-80; D. Hamlin 81-84; K. Harvick 85; D. Hamlin 86-107; K. Harvick 108-118; D. Hamlin 119-122; M. Kenseth 123-135; Kurt Busch 136-157; M. Kenseth 158-164; K. Harvick 165-170; B. Keselowski 171-173; D. Hamlin 174; M. Kenseth 175-182; K. Harvick 183-210; M. Kenseth 211-227; K. Harvick 228-258; D. Hamlin 259-260; K. Harvick 261-298; D. Hamlin 299-302; K. Kahne 303-325; M. Kenseth 326-333; K. Kahne 334-335. Leaders Summary (Driver, Times Lead, Laps Led): K. Harvick 7 times for 195 laps; M. Kenseth 5 times for 53 laps; D. Hamlin 6 times for 37 laps; K. Kahne 2 times for 25 laps; Kurt Busch 1 time for 22 laps; B. Keselowski 1 time for 3 laps. Top 16 in Points: J. Gordon – 872; D. Earnhardt Jr. – 851; M. Kenseth – 794; J. Logano – 791; B. Keselowski – 782; J. Johnson – 766; C. Edwards – 755; K. Harvick – 748; R. Newman – 747; G. Biffle – 728; K. Kahne – 708; C. Bowyer – 705; K. Larson # – 704; P. Menard – 675; A. Dillon # – 674; J. Mcmurray – 666.